The climate is getting warmer, and sea levels are rising -- a threat to island nations. As a group of researchers led by colleagues from the University of Bonn found out, at the same time, tiny single-cell organisms are spreading rapidly through the world's oceans, where they might be able to mitigate the consequences of climate change. Foraminifera of the variety Amphistegina are stabilizing coastlines and reefs with their calcareous shells. The study's results have now appeared in the international online journal PLOS ONE. Countless billions of tiny, microscopic shelled creatures known as foraminifera inhabit the oceans of our planet: some of which look like little stars, others like Swiss cheese, and yet others like tiny mussels. They are extremely plentiful and exceptionally diverse in shape. Most of the approximately 10,000 foraminifera species live on the bottom of tropical and sub-tropical oceans, are surrounded by a calcareous shell, and do not even reach the size of a grain of sand. And yet, these tiny organisms are capable of enormous tasks. "Foraminifera are ecosystem engineers," says Prof. Dr. Martin Langer from the Steinmann-Institut für Geologie, Mineralogie und Paläontologie at the University of Bonn. "With their shells, these protozoa produce up to two kilograms of calcium carbonate per square meter of ocean floor. This often makes them, after corals, the most important producers of sediment in tropical reef areas." Together with their colleagues from the Zoologisches Forschungsmuseum Alexander Koenig, the University of Trier and the Woods Hole Oceanographic Institution (USA), the scientists from the University of Bonn studied the range of Amphisteginid foraminifera. Amphisteginids are among the most conspicuous and ubiquitous foraminifera on coral reefs and tropical carbonate environments and often have been referred to as living sands. Over the past years, Prof. Langer has been capturing the range in which Amphisteginids occur along the about 9,000 kilometer-long coastline off Somalia, Kenya, Tanzania, Mozambique, South Africa, Namibia, and Angola. "The range of Amphistegina is essentially governed by ocean temperature and nutrient content of the waters," the micro-paleontologist explains. These protozoa need a water temperature of at least 14 degrees Celsius. By 2100, the protozoa will have spread almost 300 kilometers closer to the poles. Using the data from biogeographic terrain analyses, the researchers developed a species distribution model for calculating where Amphisteginid foraminifera occur under certain environmental conditions. Based on climate models, the researchers then forecast the future range of these calcareous shell protozoa. "Amphistegina are among those profiting from the rising temperatures as a result of climate change," summarizes Prof. Langer. According to the models, the calcareous protozoa will spread 180 km (or 1.6 degrees of latitude) closer to the poles through the warming oceans by 2050. By 2100, average ocean temperatures will increase by about 2.5 degrees Celsius according to conservative estimates. Accordingly, Amphisteginid foraminifera will progress another almost 300 kilometers -- about 2.5 degrees of latitude -- closer to the poles. "Our models are forecasting rates of spread of up to eight kilometers per year," says doctoral student Anna Weinmann from the Steinmann-Institut at the University of Bonn. 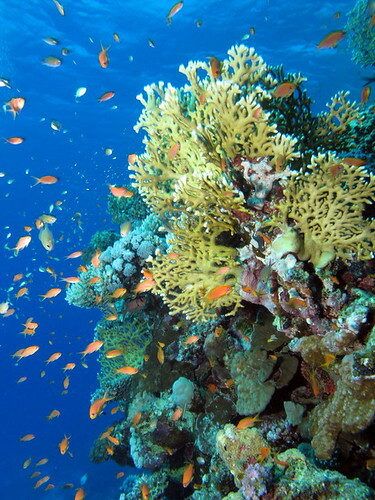 Corals can spread into new territories at similarly high rates. They do, however, have problems with the acidification of the oceans that accompanies the increasing carbon dioxide rate in the atmosphere. The skeletons of corals consist of aragonite and are thus much more sensitive to acids than the fora-minifera's calcite shell. "Amphisteginids and other foraminifera are increasingly taking over calcium carbonate production from corals, thus occupying their ecological niche. This is a role reversal in process," reports Prof. Langer. The rapid range extension and proliferation of amphisteginid and other tropical foraminifera will characterize tropical ocean floors of the future. There also is abundant evidence from the past to support this hypothesis; especially since these calcite protozoa have been inhabiting the oceans for about 600 million years already. "The fossil record shows that whenever during the history of Earth the carbon dioxide content of the atmosphere was considerably higher and the oceans were clearly warmer, foraminifera were among the most frequently occurring carbonate producers in tropical oceans," says the micropaleontologist. The capability to rapidly expand their biogeographic territory under changing climate conditions, and their prolific production of calcium carbonate, will make them key ecosystem engineers for the stabilization of reefs, beaches and islands. Island nations are already pointing to the rising ocean levels and increasing damage to their coasts today. Prof. Langer, "Amphisteginids and other foraminifera will rapidly spread in the decades to come and will contribute substantially to future tropical reef island resilience."